We can do a full custom build for you. Whether you already have the bike you want to start with or not, we can build your dream bike. See below for some examples of my previous builds. 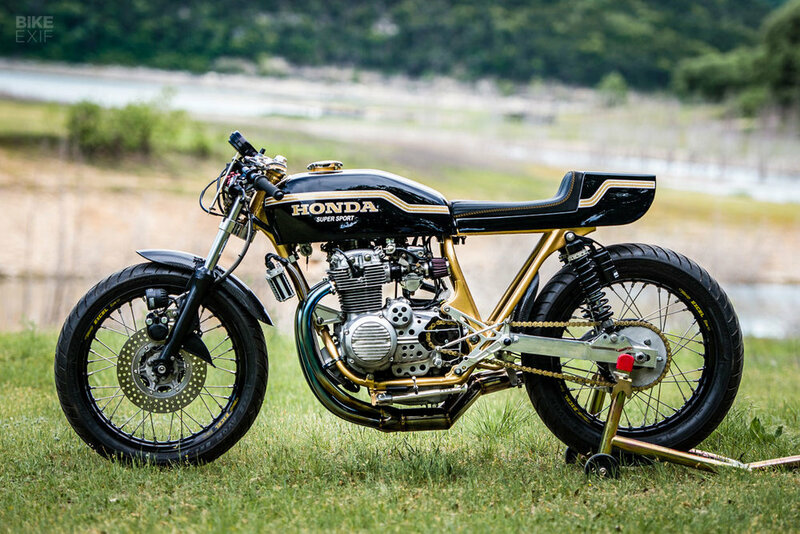 This 1975 Honda CB400f names "Goldie" has been making the rounds. She has been recently in BikeEXIF, The Handbuilt show, Mama Tried, and the Denton Independent Motorcycle Show. It started as a sun roached roller in Arizona and is now a fully built race bike that's capable of tackling a spirited ride on the street or a vintage trackday. This bike started as a roller in need of some love. The motor had no compression and finding a tank was quite the chore. The goal with this bike was to keep the stock paint theme, shed some weight and be able to ride 2 up. Bought this bike out of a storage unit. It sat since the early 80's and was untouched. Took everything off of it, and hand shaped the fiberglass seat fairing. Everything with the exception of the seat cover and foam was done in house.